A place to find your balance. Welcome to college. Welcome to new friends, new memories, and some of the best years of your life. But wait—that’s not all. Welcome to midterms, late nights, dead weeks, and stress. But fear not—there’s a place you can go to get away, take a break, and maybe learn something too. Welcome to the Duck Nest. The Duck Nest helps you develop self-care and life-balance strategies related to stress, nutrition, physical activity, and general wellness. Our center is staffed by Peer Wellness Advocates that understand the challenges facing college students. 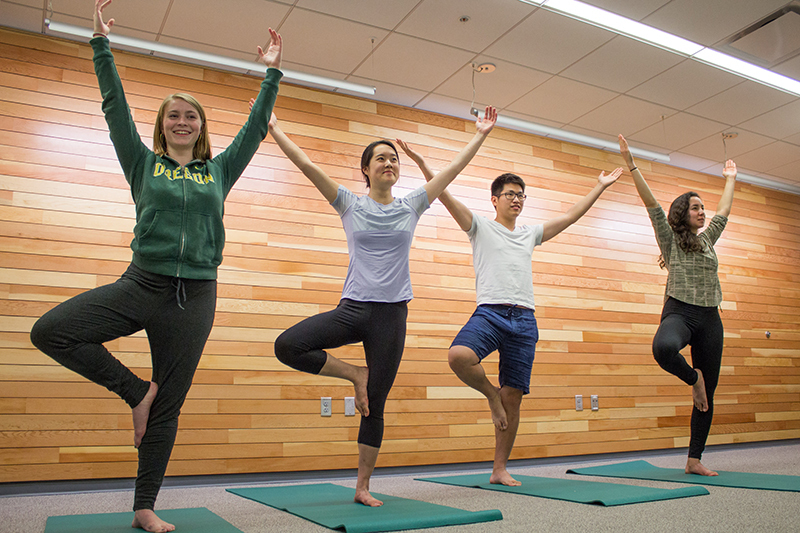 Drop by the Duck Nest for a quiet break between classes, attend our free workshops or yoga sessions, or take a meditation class. Everything we do is geared to helping you cultivate positive habits and healthy coping strategies for college life and beyond. Peer Wellness Advocates are change agents in their communities, act as liaisons to campus health services, and create and implement student-driven health and wellness programs. Want to join us? Stop by the Duck Nest and ask us about the program. Free Meal Prep Cooking Class6:00 p.m.
April 23 6:00 p.m.–8:00 p.m.
How do you even meal plan?! Can't we just stick some pizza and donuts in Tupperware and call it a day? Lucky for you, we're here to help guide you on your meal planning journey! Join us for an evening of learning the ins and outs of meal prep and skills on how to stretch your food dollar through group activities and meal planning. We're also going to be practicing some cooking skills and enjoying the food together, so come hungry! *Preference will be given to students who have not had a chance to attend a cooking class yet. The Duck Nest is partnering with Food for Lane County and UO Housing to bring free cooking classes to campus! Stress and Anxiety Management Workshop2:00 p.m.
Financial Flight Plan Drop-in Hours4:00 p.m. Dogs at the Duck Nest11:00 a.m.
Stop by the Duck Nest to pet some pups and destress for the day. If it's nice out, you'll find the dogs outside! We love having the dogs come visit us and they love seeing you! PAAWS is a Eugene, Oregon based support and networking organization for teams registered or certified with a recognized therapy animal organization. Let's Talk About Substances2:00 a.m.
April 30 2:00 a.m.–2:50 p.m. Many people on our campus use alcohol or other drugs, and this workshop will help you to identify how you can make informed choices about your substance use to avoid the negative consequences of alcohol and drug use. We'll be talking about a harm reduction strategy. What is harm reduction? It means you have choices. You could choose to quit, moderate, or learn to use substances safely. Basically, it's all up to you! You decide how you'd like to continue in your relationship with drugs and alcohol. And maybe you are one of the many people on campus who do not use substances. This workshop will also address how to approach a friend or loved one that you are concerned about. How can you use harm reduction strategies to help a friend? You'll find out! ​This workshop is free and open to UO students, faculty, and staff. Freebie Friday: Bath Fizzles12:30 p.m.
June 7 12:30 p.m.–3:00 p.m. The Craft Center and the Duck Nest wants to help you relax this week. Stop by and make your own bath bomb! We'll have various essential oils and colors to choose from. All ingredients are natural! Our Freebie Friday Workshops are quick drop-in crafts open to any UO student. Please bring your student ID. Come by for a bit between classes or stay a while. All materials are provided! Does your group want to learn more about stress management, relaxation, nutrition, sexual health, or suicide prevention? Are you putting on a tabling event and wanting the Duck Nest to be a part of it? Our team is available to present to your campus organization or living community.